Officials in Florida’s Panhandle have agreed to take out a $50 million loan to help pay for Hurricane Michael-related bills until federal reimbursements are received. City Manager Mark McQueen told officials that it will cost between $60 and $80 million just to cover debris pickup and security measures. The News Herald reports officials hope to repay the loan with the reimbursement. Bay District School, Bay County and other municipalities in the area hit by Michael on Oct. 10 are also considering similar measures. They’re borrowing the money from PNC Bank. McQueen told commissioners the hurricane is expected to put a “great strain” on the city’s budget. According to preliminary sigma estimates from Swiss Re, total economic losses from natural and man-made catastrophes in 2018 declined to USD $155 billion from USD $350 billion in 2017. Global insured losses are estimated to be around USD $79 billion, higher than the annual average of the previous 10 years. According to the preliminary report, there have been a number of smaller and mid-sized loss-generating disaster events across all regions of the globe this year, also affecting regions with well-established insurance cover. Together, these have made 2018 the fourth costliest year in 50 years of sigma records in terms of losses covered by the insurance industry. Globally, more than 11,000 people have died or gone missing in disaster events in 2018, close to the number of victims in 2017. Of the total economic losses from natural catastrophes and man-made disasters estimated to be about USD $155 billion, natural catastrophes caused USD $146 billion while and man-made disasters caused USD $9 billion. Of the total economic losses, USD $79 billion have been covered by insurance, down from USD $150 billion in 2017, but more than the previous 10-year annual average (USD $71 billion). Natural catastrophes accounted for USD $71 billion of this year’s insured losses, and man-made disasters for the remaining USD $8 billion. Examples of this year’s devastating natural catastrophe events include Hurricanes Michael and Florence; Typhoons Jebi, Trami and Mangkhut; heat waves, droughts and wildfires in Europe and California; winter and thunderstorms around the world; floods in Japan and India; earthquakes in Japan, Indonesia and Papa New Guinea; and volcano eruptions in Hawaii. The report notes that insurance contributed USD $79 billion in paid claims to lessen the hardship for people and businesses affected by this year’s disaster events.”In other words, more than 50 percent of all economic losses were insured, demonstrating again the significant contribution of the insurance sector to mitigating catastrophe risk.” the report says. Swiss Re notes that these loss estimates are preliminary and are subject to change since not all loss-generating events have been fully assessed yet. Regarding the loss of more than 11,000 people in catastrophe events in 2018, the earthquake in Sulawesi, Indonesia in September had the highest human toll of the year, with more than 3,500 estimated dead or missing. Extreme weather caused the fourth highest number of insured losses. While there has not been a singular major natural catastrophe event (such as Hurricanes Harvey, Irma, Maria in 2017) in 2018, nevertheless, the aggregated losses from a number of smaller and mid-sized events, alongside some major man-made disasters, have caused sizable overall insured losses. Citing a “troubling” number of Hurricane Michael-related consumer complaints and claims denials, Florida’s top financial regulator is urging insurers to respond more quickly and adequately to consumers recovering from the major storm that devastated the Florida Panhandle in October. Florida CFO Jimmy Patronis, who leads the Florida Department of Financial Services, called on the insurance industry to “step it up” in aiding consumers in their Hurricane Michael recovery in a conference call on Nov. 20 with more than 40 insurance company representatives and Insurance Commissioner David Altmaier. Insurance consumer complaints are handled through the DFS Division of Consumer Services. Patronis, who is originally from Panama City, Fla., compared the number of complaints related to Hurricane Michael at this point to that of Hurricane Irma, which touched almost every county in Florida when it hit in September of last year. He said approximately 30 days after Hurricane Irma, DFS had received approximately 200 consumer complaints. Hurricane Michael impacted a smaller area – just 12 Florida counties – yet DFS received more than 100 consumer complaints through the 30 days after the Cat 4 storm made landfall on Oct. 10. “There is no reason that we should have this many complaints for an impacted area that is a small fraction of Irma’s. It’s completely unacceptable,” Patronis said. As of Nov. 16, the Florida Office of Insurance Regulation reported a total of 125,356 claims for all lines of business, including residential and commercial properties. The total estimated insured losses had reached $3.4 billion with 55.3 percent of the total claims received closed. For their part, the insurance industry says they were there as soon as possible after the storm and are still working to resolve claims. In the days following Michael’s wrath, the majority of affected policyholders reported being pleased with their insurance carrier’s response, according to a survey of insurance industry performance after Hurricanes Florence and Michael from J.D. Power, which found 87 percent of Florida policyholders said their insurer had “met or exceeded expectations,” in its response efforts. The J.D. Power Pulse Survey was conducted between Oct. 19 – Nov. 2 and included 650 responses from individual home and policyholders affected by Hurricane’s Florence and Michael across four states: North Carolina, South Carolina, Florida and/or Georgia. Trey Hutt, president of Hutt Insurance Agency, which has two locations in the Panhandle, said for the most part, he has been pleased with the industry’s response to Hurricane Michael. However, he noted there is typically a lull in the recovery process about a month after the event where people have submitted their claim, had their initial visit from an adjuster and then have to wait to hear from a desk adjuster, which can take up to 10 business days in some cases. “People are very nervous when there is silence at the other end of the phone,” Hutt said. Altmaier said OIR continues to work alongside DFS to monitor the progress of the post-storm response to ensure residents impacted by Hurricane Michael are protected throughout their path to recovery. “Insurance companies must fulfill the promises they’ve made to their policyholders,” Altmaier said. McFaddin said that will be the case. “Insurers will continue to be there until properties are rebuilt and Florida communities return to normal,” she said. A burnt-to-a-crisp turkey served along a side of political discourse is just one potential disaster your insureds might face this Thanksgiving. Help things go without a hitch by sharing these quick tips. This should be a no-brainer, but drunk driving still causes 28% of all traffic-related deaths in the U.S. according to the Centers for Disease Control and Prevention. Arrange a designated driver or use a ride-hailing service when traveling on Thanksgiving. Be mindful about who drives your vehicle. It’s easy to give a friend or family member keys to the car while they’re in town, but this “permissive use” leaves the insured in the driver’s seat when it comes to responsibility for a claim. Under social host liability laws, party-givers can be held responsible when minors drink, even if the hosts were unaware that they were doing so. If a minor was drunk, chose to drive and caused an auto accident, the host could be liable. Keep a watchful eye during parties and be sure guests who imbibe are 21 or older. Pets can be easily overwhelmed by visitors during Thanksgiving; the extra noise and activity can be upsetting and people often aren’t educated about how to act around animals, which can result in unwelcome behavior by both the person and the pet. Give pets a quiet “sanctuary” behind a closed door, complete with a bowl of water, comfy blanket and special treat. They’ll be grateful. Tackling winterizing to-dos is a top priority this month, especially with house guests on approach. Be sure shovels, rakes and ladders are kept well out of the way to avoid slip-and-falls and store them properly after use. Your clients depend on you to tell them about the coverage they need. By taking 3 minutes to give them a personal umbrella quote, you’ll show them how this indispensable policy can help protect their assets and pay for medical and legal expenses should the worst happen, whatever the season. Total estimated insured losses from Hurricane Michael have reached more than $2.1 billion, according to the most recent data from the Florida Office of Insurance Regulation. The current number of claims from Hurricane Michael, a Category 4 storm that hit the Florida Panhandle before continuing a path of destruction through several other Southeast states, had reached 110,183 with 26.1 percent of that total number of claims closed as of Oct. 30, 2018. OIR compiled aggregate information from claims data filed by insurers covering all claims based on filings received. The lines of business included in the total number of claims are residential property, commercial property, private flood, business interruption and miscellaneous other lines. Residential property losses account for the majority of the total claims at 78,045 – 57,088 of that number is homeowners claims. Only 20.7 percent of residential property claims were closed as of Oct. 30. The percentage of commercial property claims closed was lower at 10.3 percent of the 4,471 claims received. Only 460 business interruption claims had been filed so far, with 9.1 percent of those closed to date. Just 64 flood claims had been filed as of Oct. 30, with 37.5 percent of those claims already closed. The Florida Department of Financial Services said in a statement Wednesday that Citizens Property Insurance Corp., the state insurer of last resort, had 3,231 claims as of Oct. 29. The number of claims will continue to be updated by OIR, which began requiring insurers to submit data on Oct. 12 with additional data calls scheduled to occur daily through Nov. 2, 2018. Catastrophe modeling firms have estimated the total cost of Hurricane Michael claims will range from $4.5 billion to $10 billion. Those numbers include losses in Florida, as well as several other states that were impacted by the storm. Karen Clark & Co. estimated private insured losses from Michael could approach $8 billion. Catastrophe risk modeling firm AIR Worldwide said its industry insured loss estimate resulting from Hurricane Michael’s winds and storm surge will range from $6 billion to $10 billion. CoreLogic estimated losses could reach $4.5 billion. While losses will be substantial, industry experts and ratings firm say they are not enough to cause problems for insurers or impact the Florida insurance market. Most losses will be paid by companies’ reinsurance programs. 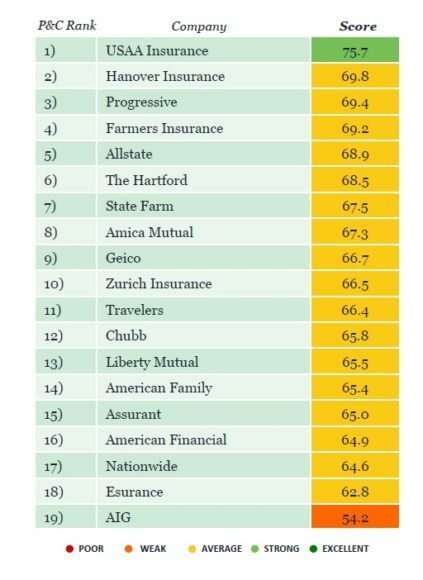 The current pricing environment for property/casualty insurers is “modestly positive,” with commercial and personal auto rates rising by mid-to-high single digits, homeowners and commercial property rates rising by low-to-mid-single digits, and commercial casualty rates showing smaller changes, according to a Moody’s Investors Service rate change and trend survey of insurers it rates. “Through 2019, we expect rate increases to exceed loss cost trends in auto lines, to roughly match loss cost trends in property lines and to lag slightly behind loss cost trends in commercial casualty lines,” Moody’s analysts say in the survey report. Moody’s says personal auto rate increases of 7.0 percent in 2016, 7.5 percent in 2017 and a targeted 6.5 percent for 2018 should decline toward the low-to-mid-single digits, given the improving combined ratios. Moody’s sees 2018 catastrophes including Hurricanes Florence and Michael extending the moderate upward pressure on property rates, especially in areas that suffered the most losses. Personal auto insurers’ rate increases of about 6.5 percent in 2018, after 7.5 percent in 2017, should support continued improvement in underwriting results. Moody’s expects these rate increases to slow as auto loss frequencies and combined ratios decline toward 100 in 2018-2019. Underwriting results deteriorated in 2015-16 due to more miles driven, more distracted drivers, and higher repair costs for vehicles with sensors and cameras. Insurers expect loss frequency trends to decline over the next few years thanks to collision avoidance technologies. Moody’s sees large national personal auto insurers continuing to gain market share at the expense of smaller regional companies with large, low-cost direct writers continuing to grow the fastest. Homeowners insurers, which sought overall rate increases of 4.5 percent in 2018, expect rates to keep rising by low-to-mid-single digits to keep up with rising costs for construction labor and materials. Moody’s believes the 2018 catastrophes will keep the upward pressure on homeowners and other property rates. At the same time, abundant capital will keep a lid on overall rate increases. Given catastrophes and rising construction costs, watch for rates to continue upward on a moderate pace. Commercial property insurers sought overall rate increases of about 4.0 percent in 2018, an improvement from overall declines in in 2015-16 and flat pricing in 2017. Moody’s expects insurers to continue boosting rates by low single digits. While the 2018 catastrophes will keep the upward pressure on loss costs and rates, the P/C market has “ample capital to absorb the latest events and limit the overall rate increases,” says the report. Despite significant rate increases since 2012, commercial auto remains one of the worst performing P/C insurance lines, although there has been gradual improvement, according to Moody’s. Rate increases of about 9.5 percent in 2018, following increases of 7.0 percent in 2017, will help reduce combined ratios from recent highs to about 105-106 in 2019. Insurers see commercial auto loss costs rising by 4 to 5 percent in 2018-19, reflecting increased miles driven, higher attorney involvement in claims, a jump in large claims (over $10 million) and a tight labor market with transportation firms hiring inexperienced drivers. “We believe the rising loss costs have led to an overall reserve deficiency for the commercial auto line,” Moody’s says. Moody’s surveyed insurers have sought professional/specialty liability rate increases of about 1.5 percent in 2018 after slight declines in 2016-17. Yet Moody’s projects that combined ratios will deteriorate from about 102 in 2017 to 104 in 2019, partly because of rising costs of directors & officers and errors & omissions claims. Moody’s surveyed insurers have sought rate increases of about 3.0 percent for the commercial multiple peril line in 2018, up from 2.0 percent in 2017 and 1.0 percent in 2016. Commercial multiple peril is split about 63%/37% between property and liability coverages. Catastrophe losses pushed the combined ratio up to about 107 in 2017 after four years in the mid-to-high 90s. Insurers expect the non-catastrophe loss ratio trend to remain slightly below the long-term average of 1.3 percent. Moody’s said insurers indicated “some increase in risk appetite for this line” for 2018-19. Meanwhile, increased attorney involvement in claims as well as rising construction labor costs pose potential challenges.